This subject is a regular visitor to the message board and 'Knowledge' section of Mini Magazine for whom I write - fitting bigger wheels. Predominantly 13-inchers, but 12s as well, the main thrust of the questions being 'what do I need to do?' along with 'which wheel arch extensions will I need?' The answer has always been somewhat 'clipped' purely because of the space availability issues both in the magazine and on the message board, so something a little more detailed was required. Although the Mini suspension was designed around the use of 10-inch wheels with cross-ply tyres, a quick dash through history reveals that fitment of these bigger wheel sizes isn't a recent, 'modern' application. Very early on in the Mini's racing career it soon became apparent that something needed to be done to make racing tyres last more than a few laps. Tyre technology at that time was just starting to 'break the mould' so to speak, but couldn't cope with the new demands set upon it by the Mini's package of doing everything at the front - steering, braking, and drive. A combination that would simply fry tyres in competition use after far too few laps. John Cooper's cars started wearing 12-inch wheels in the late sixties to give more tyre area to help them run cooler and therefore keeping the car competitive and winning. Many scribes have inferred that the current boom in fitting 13-inch wheels is down to the recent addition of them to mainstream production, i.e. the Sportpack Coopers. I don't share this view - what a surprise! 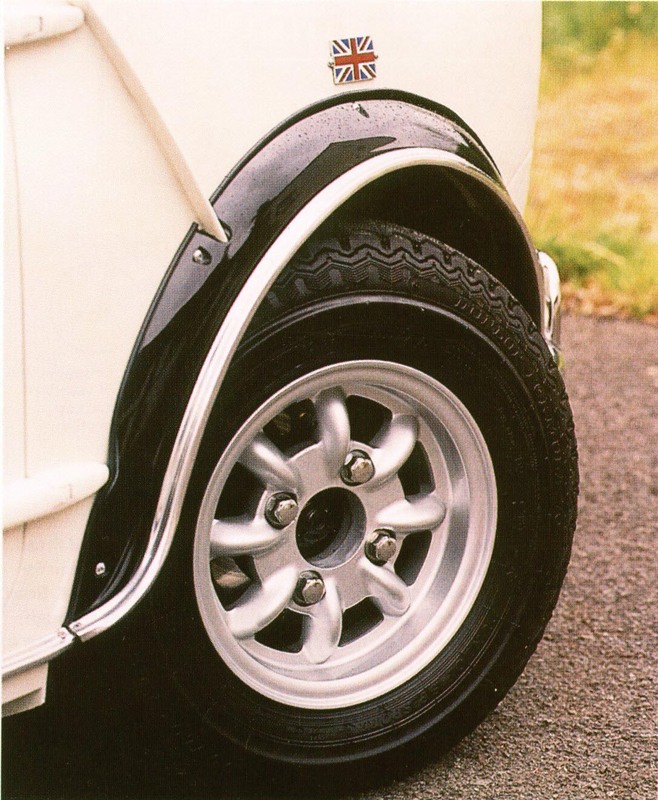 13-inch wheels gained popularity in the mid to late seventies with Mini racers because of tyre choice. All that was really generally available in the way of 10-inch slicks were the comparatively expensive Dunlops used by the Mini Miglia racers. A wider choice of compounds was available in the form of ex single-seater front wheel qualifying tyres at miniscule expense - in 13-inch only. To be competitive in rallying and rally-cross, again the bigger tyre choice was 13-inch orientated. So Mini racers started sporting 13-inch wheels. And what's good enough for the racers…how so many trends start, and where I believe the influence came from for Rover to go this route - they could see it was what people wanted. There are a number of things that need serious consideration no matter which wheel/tyre combination you decide to go for. 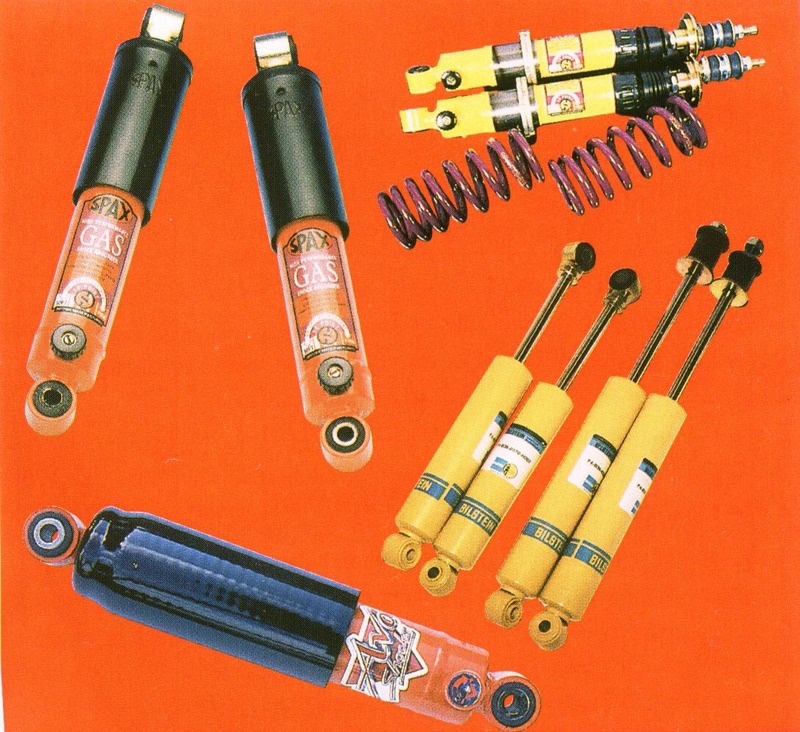 First and foremost is suspension and steering component condition. The original 10-inch combination is relatively 'forgiving' - masking slight component wear simply because it has relatively low leverage effects and dynamics as a whole. This encompasses everything affected by wheel/tyre weight and profile and the grip afforded by the tyre contact patch on the road. Wheel/tyre weight affects damper performance - their ability to keep the tyre in contact with the road surface the main issue. It also affects acceleration and deceleration generated by the 'flywheel effect' and steering by the 'gyroscope' effect. Tyre profile affects ride, comfort, handling and grip. All these conspire to exaggerate any shortcomings in the suspension and steering components. Slightly worn swivel pins, top arm bearings, bottom arm and tie-rod bushes, track-rod ends, steering rack, and wheel bearings will become very worn in a very short space of time. Tired dampers will not be able to keep the wheel/tyre in contact with the road. This can be dangerous - it will adversely affect safety, as you are completely reliant on those four small tyre contact patches whatever you do in a car. If the tyre isn't in contact with the road surface, you can't steer, stop, or go. As outlined earlier - a situation made very much more difficult in a Mini (or any front-wheel drive car) as it's all going on at the same end at the same time. Lower profile tyres have less flexible tyre walls - affecting ride quality (making it bumpier), and less compliant (will follow all ripples, bumps and cracks in the road surface). Although it has to be said that a number of modern sports cars have huge wheel/tyre set-ups to not only increase grip - the larger over-all circumference 'bridges' some bumps/holes, thus 'smoothing' the ride out by reducing/eliminating some of the smaller bumps. Wider tyres will usually increase grip that will apply greater leverage against all the suspension locating bushes and bearings. Any that are worn will cause the increased leverage to push and pull the suspension into unwanted positions/angles. The result is a wayward car that doesn't handle well - seemingly developing a mind of it's own at inopportune moments if not all the time. The more grip the tyre develops, the easier it is for it to overcome the baking capability of the set-up on your car - the extra leverage applied by the bigger over-all diameter worsening the situation. Up-rated dampers are a must. The standard items are barely capable of dealing with the standard set-up when brand new (a nod in the direction of 'comfort' by the OE manufacturers) let alone when worn. Bigger wheels/tyres means more (un-sprung) weight to control when encountering road surface imperfections (bumps/pot-holes). The barest minimum should be 20% up-rated standard-type dampers. Personally I would only recommend starting at Kayaba 'Gas-A-Just' dampers (my current preferred type for cost/performance and fit), if not going to one of the adjustable sports types. The message here then is to make sure your whole suspension is in first class condition before contemplating the change. 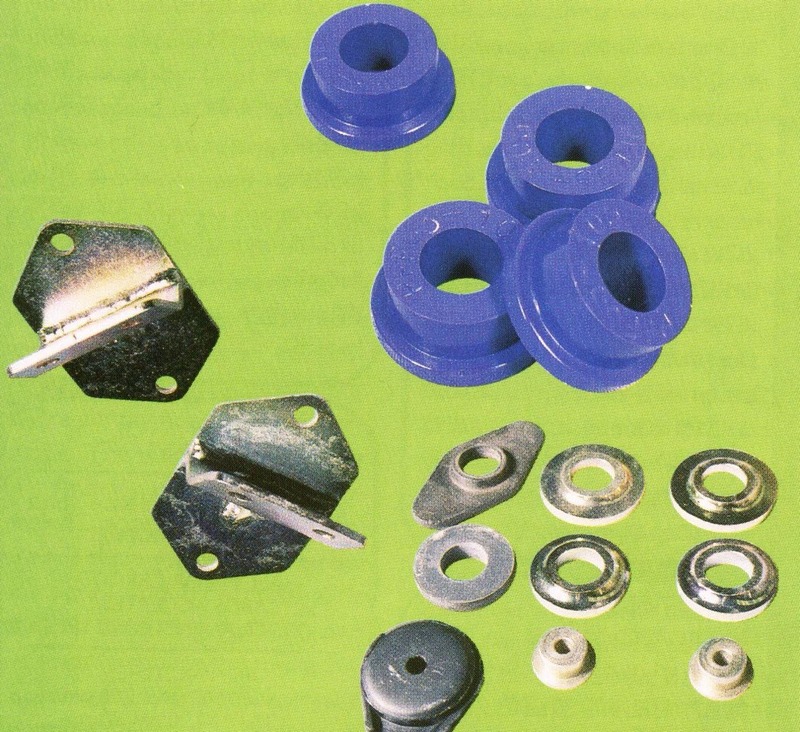 This is an ideal opportunity to fit up-rated components if worn bushes need replacing. Up-rated bushes offer greater resilience in both wear and movement, which will help provide greater suspension location and control when a bigger wheel/tyre combination is fitted. Essential to maintain the good 'handling' aspects believed to be endowed by the Mini's original design. And make sure your braking system is capable of dealing with your wheel/tyre choice. A change in pad/friction material (see Calver's Corner articles on 'Brakes - pads functions and parameters' and 'Pad types and choices) can often set this right. Then we have your own personal mechanical capabilities to consider. Do you have the equipment, skill, or at least confidence to do the swap? In many cases this is going to be more than just simply un-bolting one set of wheels and throwing the smart new bigger ones on. Unless the wheel/tyre combination you have chosen is known to fit without any other modifications to your car (like fitting OE 12-inch Minilite-style Cooper wheels to a Mini-originated disc brake set-up), sure as eggs is eggs, some surgery of some-sort is going to be needed. Be these fitting wheel spacers to modifying bodywork. If you can't, then you may well have to pay somebody to do it. All of the foregoing can add considerably to the cost of the planned wheel/tyre change. Undoubtedly the easiest to apply from drum braked-cars upwards. Because these wheels were designed to fit disc-brake endowed cars, it will be essential to fit wheel spacers to drum-braked variants. The reason being that the wheels have a lot of 'in-set' to counter the wider tracking given by the disc brake geometry. In most instances this is more because of a lack of clearance at the rear than the front. Just how big the spacer needed is will depend entirely on the aforementioned in-set of the particular rims you desire or have acquired. The legion of different manufacturers makes it impossible to list whose needs what, so this will only be assessable by trial-fitting the wheels/tyres and see what gives. Alternatively, fitting a set of drums as used on the rear of the disc-brake cars (part number GBD106) along with their matching longer wheel studs (part number 21A1278) and retaining screws (SF604121) will negate this problem entirely and give the car that 'wider', more purposeful stance. It will also mean wheelarch extensions will be needed, but will complete the aesthetics. 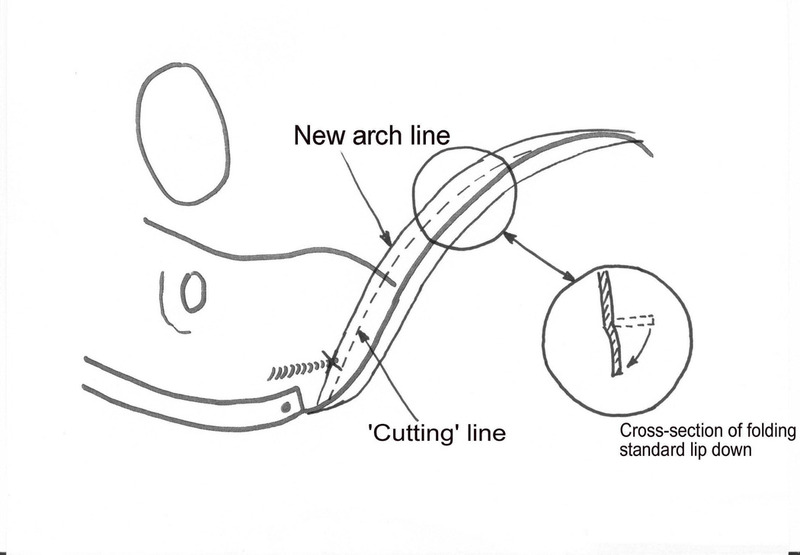 For those that are abhorrent of arch extensions - it's the trial and error route for you. The only other major problem when fitting 12-inch combos is tyre-to-arch clearance at the leading edge of the front wheel arch. Not a problem when the standard fitment 145/70/12 tyres are used (unless something is out of line body/subframe/suspension-wise in a major way), but can be an aggravation when using the more popular, wider 165/60/12 low-profile types. Half the time this is because the front caster angle is too great, generally caused by bent tie-rods, worn/collapsed/AWOL bushes, or incorrectly set adjustable tie-rods. There is no need for more than 3 or 3.5-degrees caster angle on a road-going car. The other major contributor is subframe to body alignment, more prevalent on the later, rubber-mounted front subframe cars. They are simply not always square and true. This is why on some later Minis (mainly the 12-inch alloy wheeled Coopers in the early '90s) have shim-plates between the front panel to front subframe 'tear-drop' mounting. It's not to 'square' the subframe, as some seem to believe - quite impossible considering the magnitude of the bulkhead retaining bolts - but simply to space the front panel out away from the wheel/tyre! These shim-plates are available under part number 2A4292. Using them will normally solve any slight fouling problems experienced. Having said that - there is a point of no return - or actually a point where any more shims actually starts to worsen the problem. As the panel is pushed forward, there is only so far it can be pushed before the wing/front panel section starts deforming, pulling the wing in. This causes the arch to tyre clearance to start reducing again. Where the 165/60/12 tyres are used on the rear, it is generally necessary to fit a 5mm wheel spacer shim with associated longer wheel studs. Both of which are readily available (spacer shim part number SR4, and stud part number ENJO1039) . And whatever you do, don't be tempted to fit very cheap 155/70/12 tyres. I cannot describe how they completely destroy the handling, and aggro caused when trying to fit some of them to the car. The 13-inch wheel/tyre combination brings out the worst in everything Mini suspension and brakes orientated - but to many the aesthetics far out-weigh all other considerations. And there are many considerations. Those who believe they are fitting this combination for increased grip and handling capability on a road car need to think again. Most of the 13-inch tyres are manufactured for heavier cars. This means a harder tyre compound is used. A Mini simply doesn't get the tyre up to its proper operating temperature, so the increase in grip originally hoped for doesn't materialize or isn't maximised. 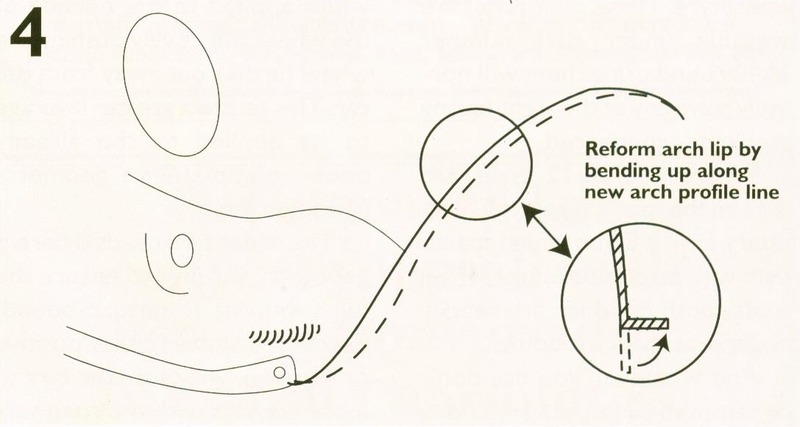 Wayward handling (unless suitable suspension set-up has been applied), heavy wayward steering, and exaggerated bump-steer are further consequences. These are caused by the offsets employed, necessary to get suspension clearance. 13-inchers are generally wider than standard rims, so the wheels are made with the greater portion of the extra width applied to the outside of the wheel, effectively pushing the wheel further out away from the car. This causes a greater leverage to be applied to the already poor bump-steer geometry of the Mini. The wider tyre needs different geometry settings to ensure the full footprint is road-surface bound as the lower, stiffer side-wall does not distort as easily as the 10-inch tyre types. Excessive camber - positive or negative - will cause the tyre to loose contact with the road surface when cornering or with extreme steering in-puts. This then causes the tyre to follow any deviations in road surface. The offset dimensions employed can also mean wheel spacer shims are required in certain combinations to gain clearance, and even the steering rack may need replacing with the one used on the Sportpack cars - and these are definitely not cheap, costing in excess of £100. These have built in lock-stops to reduce the turning circle to prevent the tyre scrubbing the inside of the rear of the inner front arch. Again, the types and styles are legion, so doing a comprehensive and accurate whose needs what is impossible in a few pages. The increased footprint increases drag - responsible for reduced top speed, reduced acceleration, increased fuel consumption (all neatly illustrated by the difference in performance figures between the Sportpack cars and the 12-inch shod variants, the 13-inchers suffering 6mph slower top speed and 0.6 seconds slower 0-60 with less mpg). This larger footprint-induced grip/drag increase will help with braking, but only if the brakes are equal to the task. The wheel diameter also gives a greater ('longer') leverage working against the brakes. The combined larger footprint and greater leverage means fitting 13-inchers to a drum-braked Mini is an absolute no-no. They simply over-come the applied friction capability of the shoes. Disc brakes are a must. Even the 7.5-inch S type discs are a little marginal in my opinion/experience unless steps are taken to maximise their performance envelope. The 13-inch combination is a good deal heavier in most instances than the standard set-up so up-rated dampers are an absolute must. Having considered, dismissed or navigated round the aforementioned problems and are still serious about fitting 13-inchers, one thing is certain - body surgery will be necessary. Pictures speak a thousand words so look at the relevant following diagrams to see what's involved. There is far more to fitting a set of aesthetically pleasing bigger wheels and tyres than meets the eye. A majority of which can potentially seriously affect the safety of not just you and your passengers but other road users too. Think long and hard on this before making the change. If current suspension and subframe bushes/mountings are flagging, take the opportunity to fit up-rated ones. Particularly the front subframe tower to bulkhead and front-panel to subframe items. May slightly increase noise transmitted through the shell, but outweighed by elimination of wayward front subframe movement. Stating which arches are needed for which wheel/tyre combos is impossible - not only because of the different wheel fitments, but personal taste too. Although it is possible to do the whole wheel fitment thing in a day, it's worth taking your time over to get it right and to your personal satisfaction. I'd love a pound for each person that's been unhappy with a hurried result and 'first guess' arches. Rover Sportpack steering rack and standard racks look very similar, but Sportpack one has reduced turning circle to prevent tyre-scrub on the inner rear front wheel arch section. Incredibly, many Mini Parts suppliers recommend - and some insist - this rack is fitted where prospective 13-inch wheels are asked for. The cost price however, is cripplingly and generally this isn't needed unless wheels with a deeper in-set (majority of extra wheel width is moved in towards the car) are used. Far and few between coz the wheel manufacturers just know you lot love wheels that stick out a-ways! First job is to jack vehicle up, place it securely on axle stands, remove wheels/tyres, arch extensions if fitted and front bumper, then create the new arch profile. Doing this free hand is fine for the artistic/experienced. For those not in either category, its advisable to make templates out of thin card or brown paper or such. 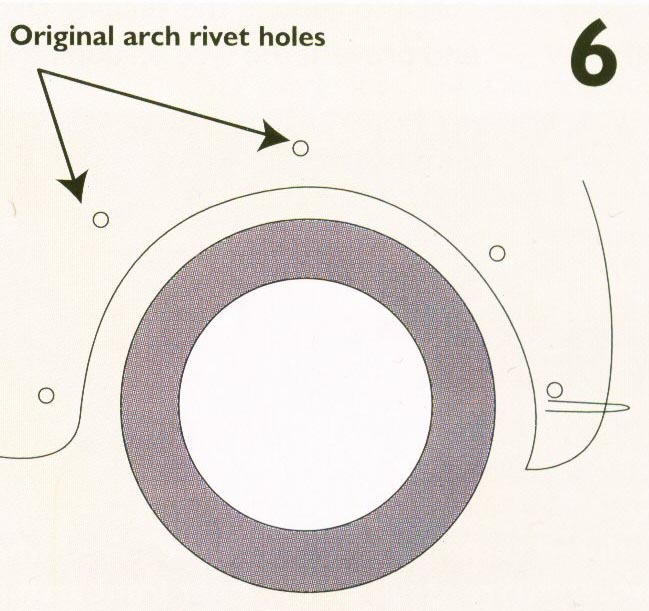 Start just ahead of the arch peak, and use a gentle curve that passes through the foremost and lowest original plastic arch retaining rivet hole. If not, measure in 1.25-inches from the arch line at bumper platform curve level. Once you're happy with your profile, transfer this to the arch itself by taping the template in place and drawing round it. Remove template and flatten the original arch lip using a hammer and dolly preferably (gives a better finish), or Vise grips if not. 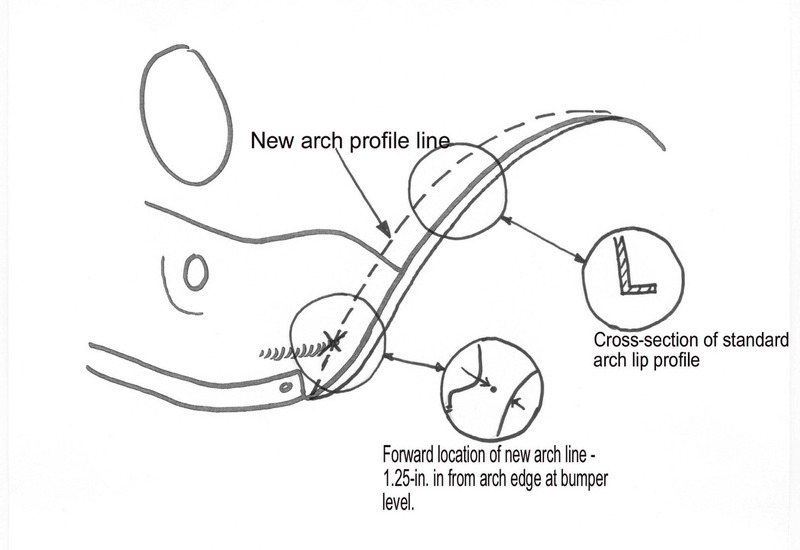 Now draw a line free hand or stick a strip of 0.50-inch/13mm wide masking tape along the arch side of you new arch profile. The section of arch outside this second line needs removing by cutting it away with either a suitable hacksaw or sheet metal cutters. Which ever, be VERY careful not to cut yourself on the very sharp edges. Wearing thick gardening gloves, welder's gloves, or such will help here. Reform the arch lip along the new profile line again using hammer and dolly for a neat finish, or vise grips. Once again being very careful not to cut yourself. It isn’t essential to re-form this lip, but it adds a great deal of stiffness to the panel so is highly recommended. 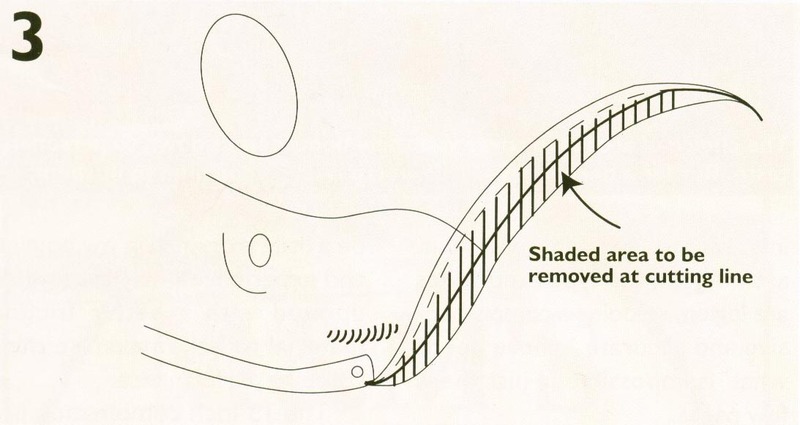 If you really don't want to re-form the lip, then the arch needs cutting along your first, new arch profile line. Once completed, grind/file the sharp edge off the new arch profile you've formed. Before going any further, fit the new wheels/tyres, lower the car onto it's wheels, and turn the wheels lock to lock to ensure clearance. It's easier to deal with any extra trimming now before the job's finished off. Treat the cut metal area with at least something to stop it rusting, if not re-painting it properly. 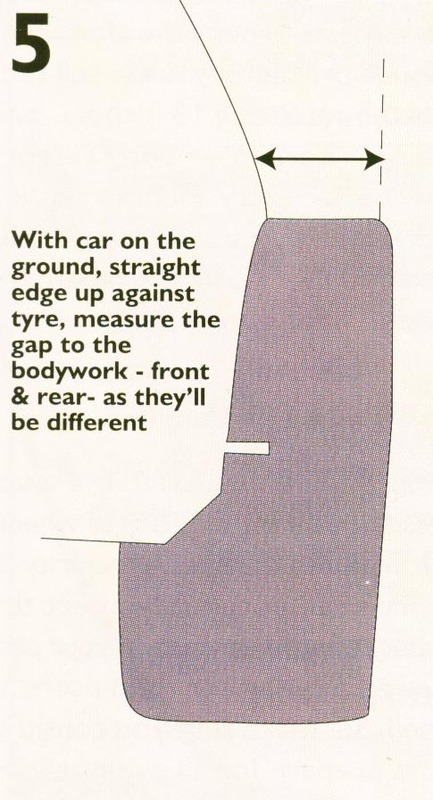 The only way to know exactly how wide the arch extensions you're going to need should be is to fit the wheels/tyres, and measure how far they stick out from the bodywork. Mini Spares Centre/Mini Mania have catalogues that not only show what the arches look like fitted to a car, but also their fitted dimensions. Others, you'll just have to ask. Don't forget to do something about existing arch extension holes if there are any. Either by using an arch extension that covers them up, or filling them in. The latter could be difficult/expensive as to do the job properly will require filling the holes in, then re-painting.